The Holy Grail of smartphones these days is the truly bezel-free display, something that has even evaded Apple with the iPhone X top notch – but now the Doogee Mix 4 has fixed the problem. Yes you may not have heard of Doogee or its Mix 1, 2 and 3 phones before – but the Mix 4 is that unique it could just put the company on the map, and in plenty of pockets. Doogee, the Spanish phone manufacturer, has revealed its Mix 4 which uses a nifty slider function to allow the screen to move up and down. As a result the front facing camera and sensors are hidden behind the display which allows for a truly bezel-free screen. The Doogee Mix 4 is currently a concept design that features a 5.99-inch screen with an amazing 97 percent screen-to-body ratio. 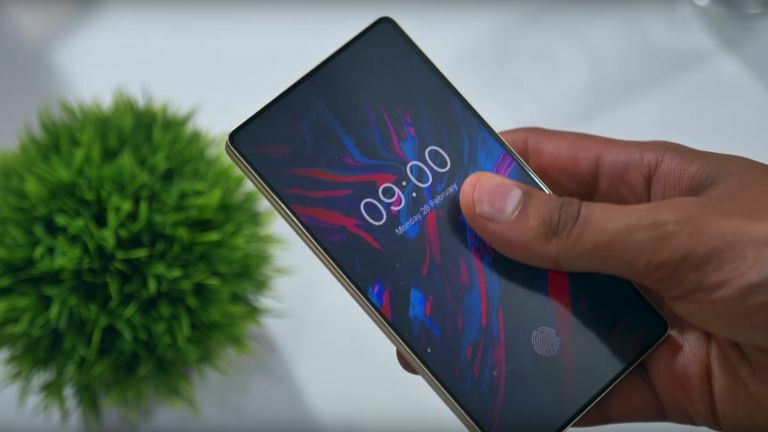 This should also feature a fingerprint reader built into the screen, judging by a picture that shows a fingerprint on the display. Once again, something Apple and Samsung have failed to implement so far. Other specs include a dual rear camera and Qualcomm Snapdragon CPU – but at this early stage more details are yet to be revealed. Rumours suggest the Mix 4 will launch, based on current release schedules, in December this year. So perhaps Apple and Samsung will have launched their versions of bezel-free devices with fingerprint reading screens by then too. Images from YouTube channel Mrwhosetheboss.